Nato and Afghan forces have captured at least two suspects linked to a dramatic Taliban assault on the US embassy and Nato headquarters in Kabul, US military officials said on Thursday. A Taliban suspect and a member of the Pakistan-based Haqqani network were held on Wednesday a day after the attacks in the Afghan capital which left 15 dead, the Pentagon said, quoting ISAF reports. The Taliban suspect “and his associates are linked to multiple attacks against Afghan and coalition forces, including the September 13 attacks on the Nato headquarters and the US embassy in Kabul,” the statement said. The Taliban suspect had also planned vehicle-bomb attacks and was captured in Afghanistan’s Paktiya province, it added. The brazen assault raged for 19 hours amid a hail of rockets, grenades and suicide blasts as Afghan and foreign troops battled insurgents. 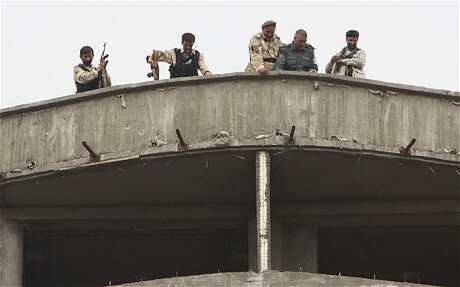 The standoff ended when troops finally killed the two last insurgents who had held out overnight in a high-rise building under construction just a few hundred metres from the heavily guarded US embassy.